It's been confirmed that Russell Peters is coming back to Muscat again for another show in his new 2016 World tour, Almost Famous. 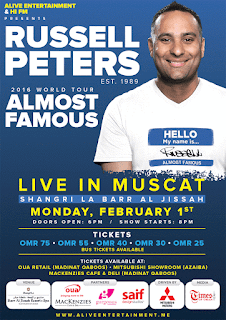 The event is being held at the Shangri La on Monday 1st February, doors open at 6pm and the show starts at 8pm. Tickets go on sale today at 4pm.